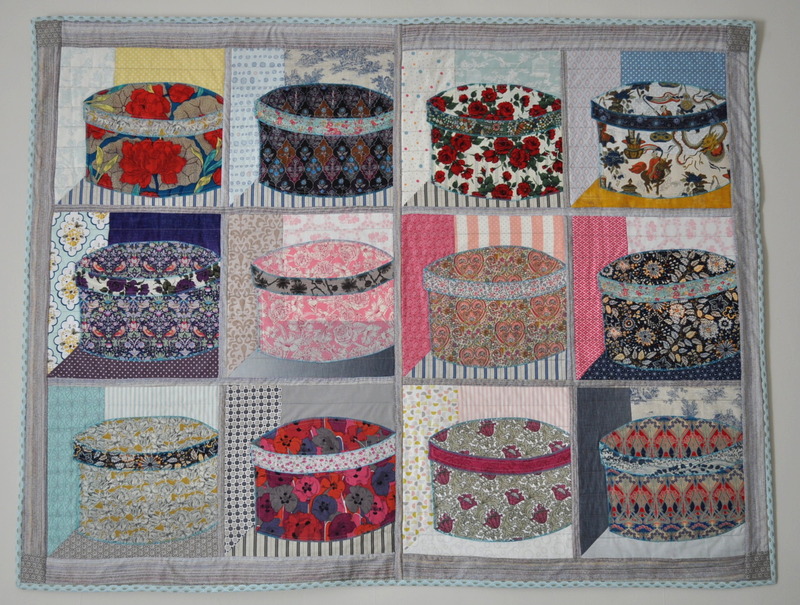 It’s the hat box quilt of course but it sounds so lovely in French and makes a change in my list of blog post titles. So, it’s done! 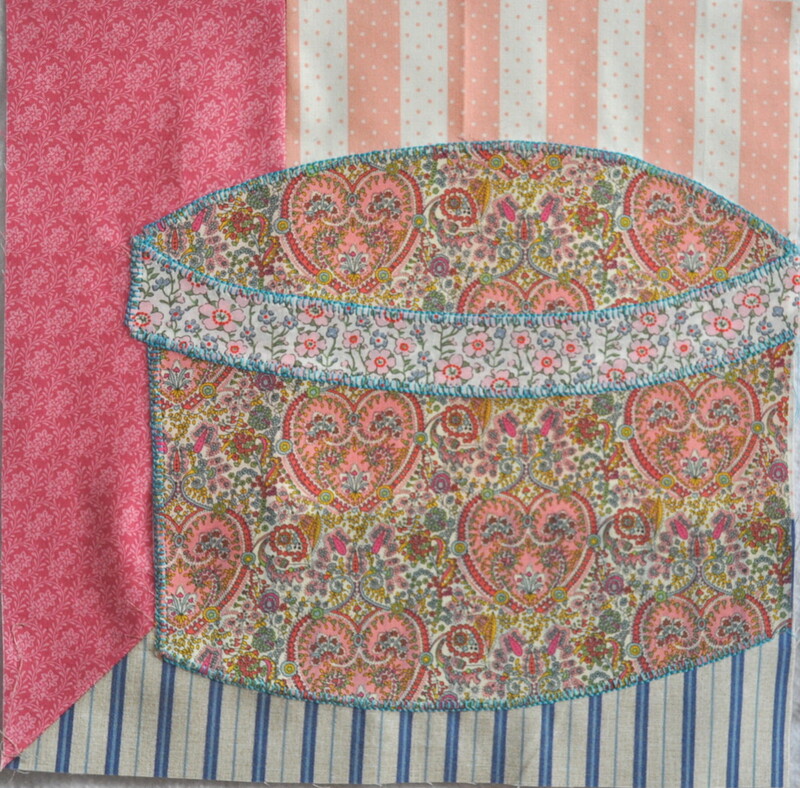 Kate and I have been furiously fairly calmly making hat boxes over the past year or so from a book we both happened to have – ‘Passionate Patchwork’ by Kaffe Fassett. 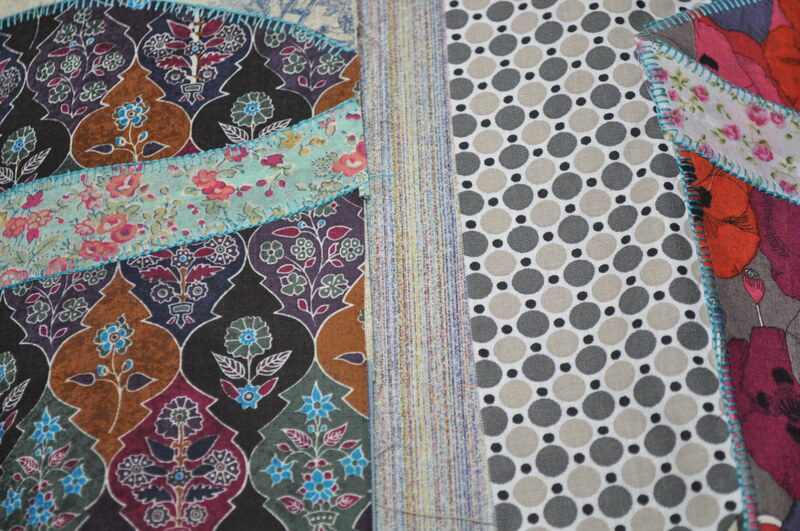 Kate is making a full size quilt while I decided to make a wall hanging – which is why I’ve finished first. 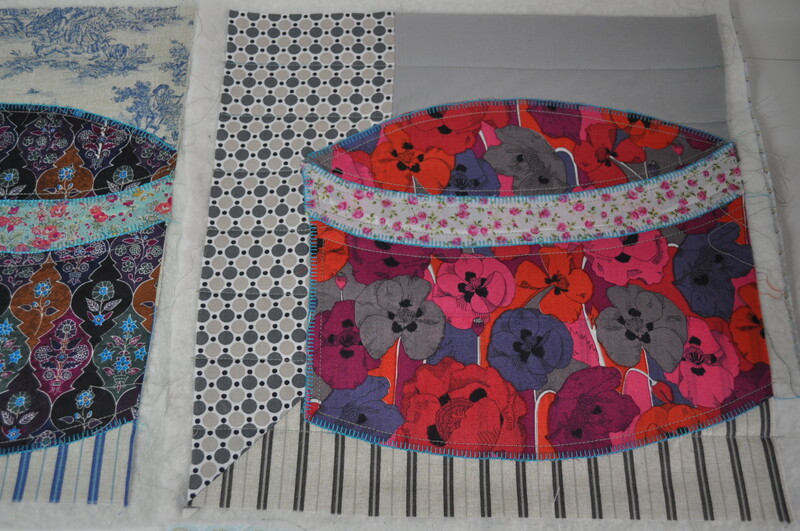 Well, that and she is hand quilting and I took the easy way out and used a machine. 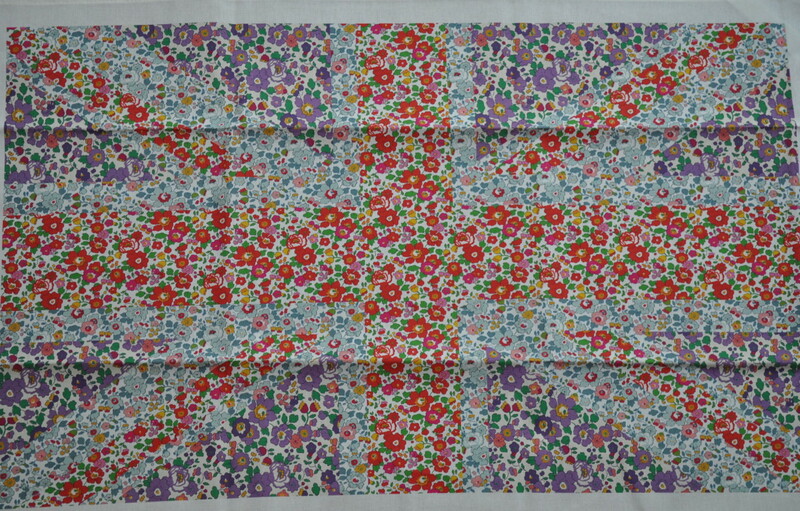 I have lots of Liberty of London fabric and decided this would be a good way to showcase some of them. ‘Perfection is the enemy of progress’ I’ve heard it said and that is certainly the case as far as this project went because, had I decided to go back and fix some of the mistakes I spotted after the event, I would still be putting it together now and getting fed up with it. Instead of that, it is assembled, hung up and, apart from one thing which will bug me forever because I thought about it beforehand and then forgot to do it, I’m quite pleased with it. 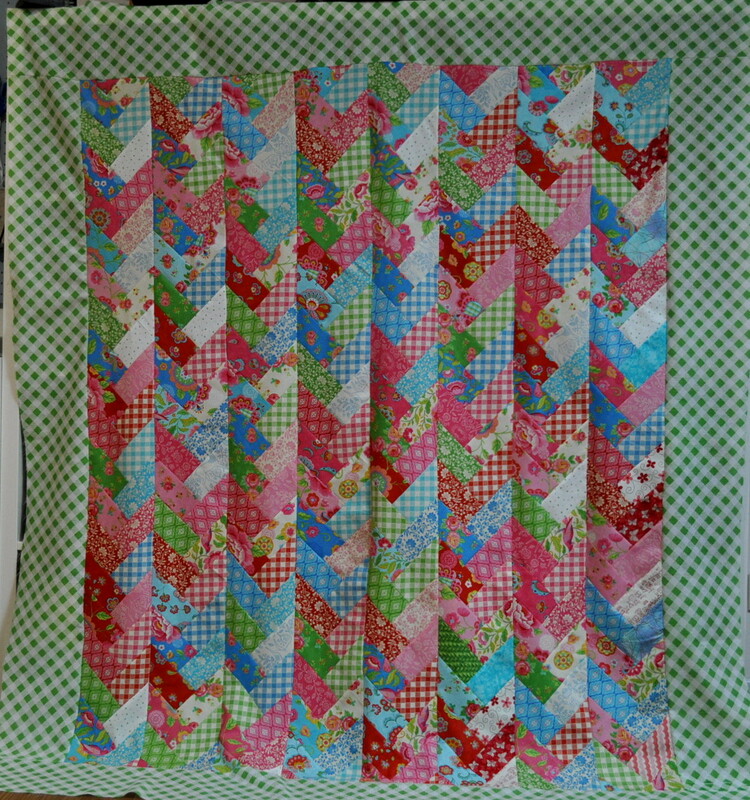 So, you can zoom in on it if you are the Quilt Police and have fun finding all the faults but I know they are there and I can live with them. I wasn’t sure how to hang it – I’ve got no other wall hangings in the house – but knew I didn’t want any hanging mechanism to show. 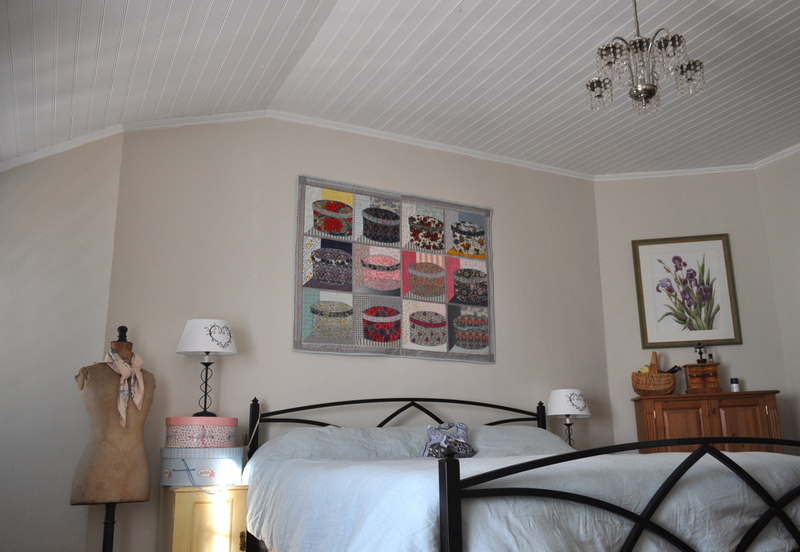 I searched around a bit and found a tutorial based on the method used by a Museum of Quilts in the United States to hang the quilts they have on display – you can find the method here. 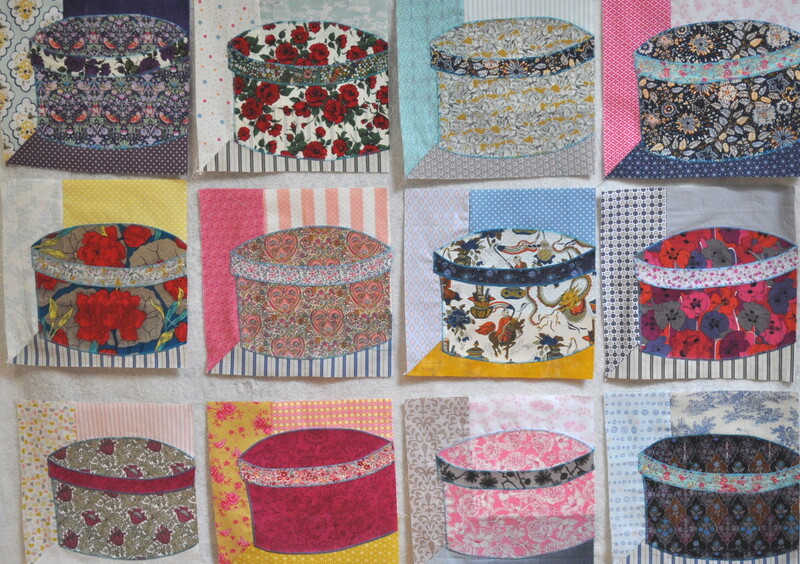 So now I’ve shown you the big picture, here are some of the quilt in action. 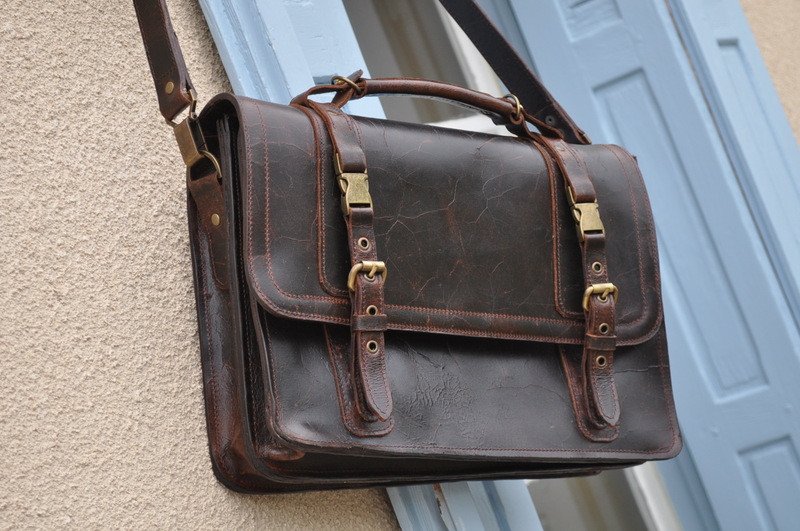 Astonishingly – you know what men are often like about such things – Mr. Tialys is quite approving of this and has even asked if perhaps we could have something in a discreet corner of the lounge (I did note the word ‘discreet’ by the way). Now to go and put the books, tissues, glasses, alarm clocks, hand cream and all the other usual paraphernalia back on those bedside cabinets. Get me and my staged photos (otherwise known as ‘tidying up’). I’ll be applying filters, drawing faces in my cappuccino froth and using my Instagram account next!! You may have noticed I’ve been a bit quieter than usual but that’s because I had a friend visiting for a week and then I went back to the U.K. with her to spend a long weekend with my Mum. 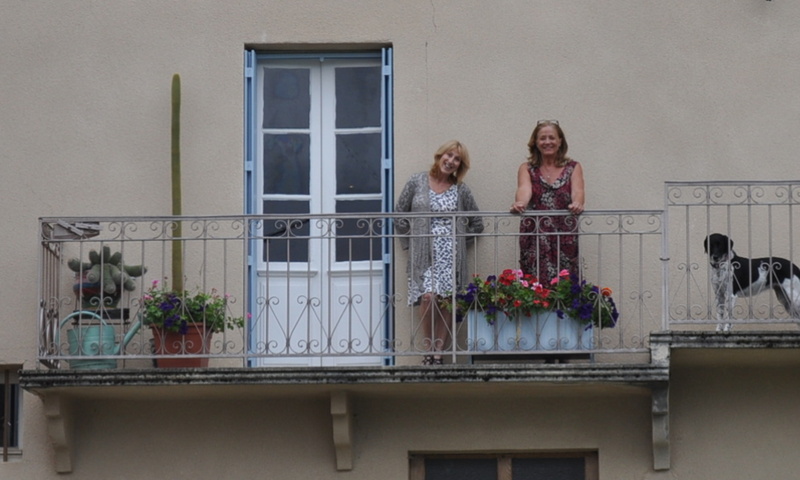 My friend and I go back more years than I care to remember but, despite keeping in contact with Christmas and Birthday cards we’ve only recently started to see eachother again so I was really pleased when she said she’d come over to France for a visit. Here we are on holiday in Tenerife back in the day looking bronzed but blurry on the balcony of our hotel room. Another balcony, another country, another era. 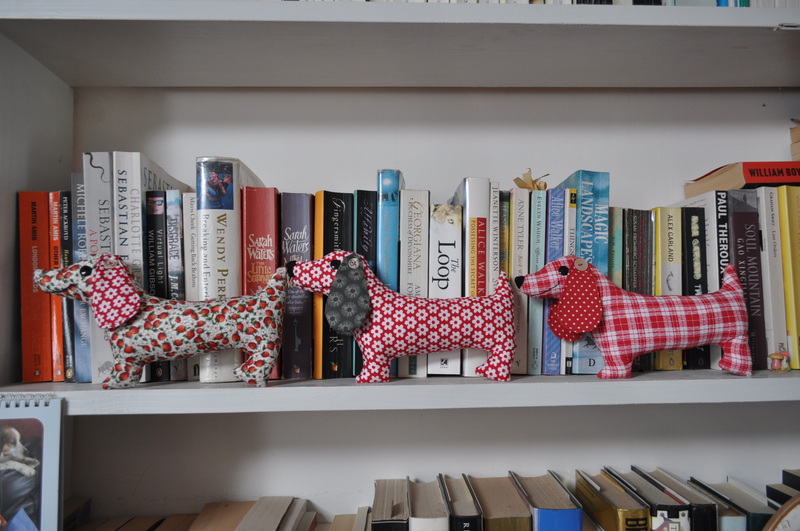 I knew that the weekend spent with my Mum would be of the quiet variety as she is getting very tired lately and, once we’d been out in the morning for a bit of shopping or a brunch somewhere, she’d had enough of the outdoors for the day so I went prepared with fabric and pattern and used her sewing machine to make another couple of dogs for my eventual doggy garland while she had a snooze. I’m going to make another three and figure out how to make a craft stall enhancing garland out of them but I’ve got until the end of November so something will come to me before then I’m sure. Since I’ve been back and trying to catch up on emails, Etsy shop goings ons, reading blogs and dog and cat related problems, I haven’t got much done. 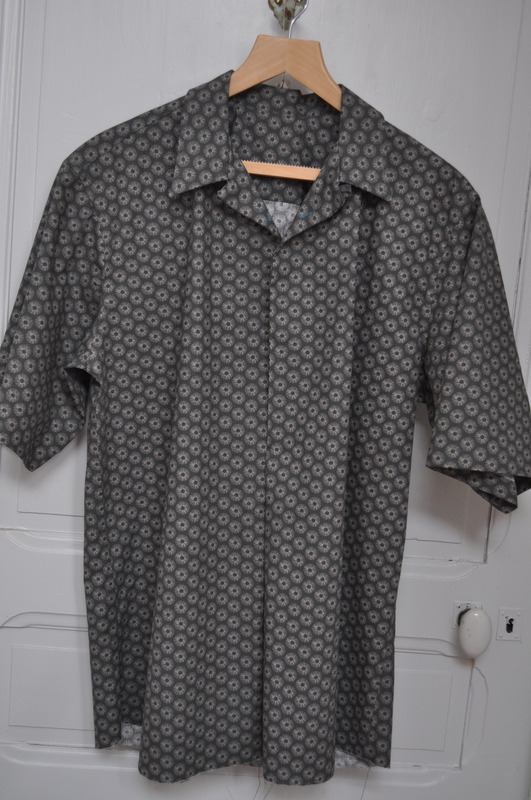 The Colette Negroni shirt I’m making for Mr. T. is still at the muslin stage – just needs the buttons and buttonholes and final hemming and then I can confirm what I’ve suspected for a while – it will be too small for him. I know it’s a muslin but I was hoping it would be a wearable one. We won’t know for sure until I finish it though will we! 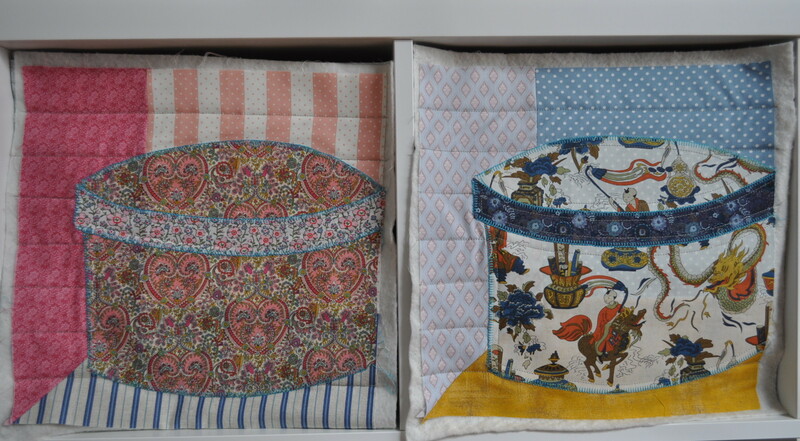 I rush quilted a couple of my hatbox blocks which was easy because the machine quilting I’m doing couldn’t be plainer or simpler unlike the lovely hand quilting Kate’s doing on her version. 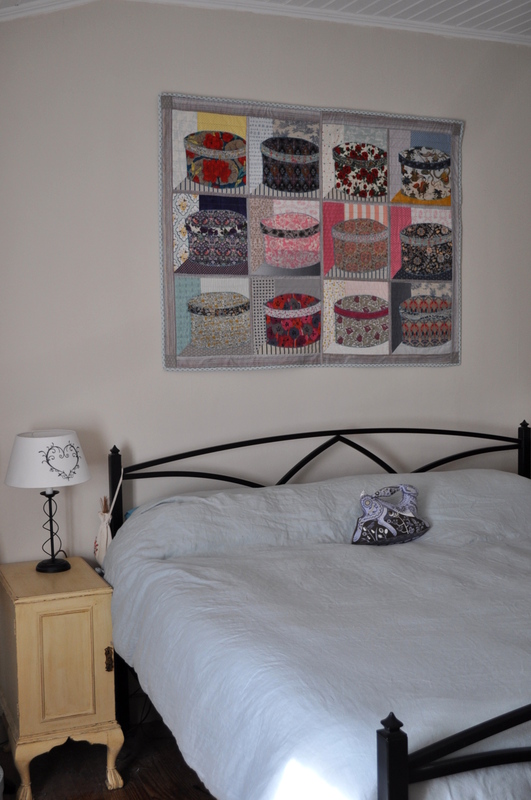 Mine’s a wall hanging so nothing too fancy is called for – well, that’s my excuse anyway. 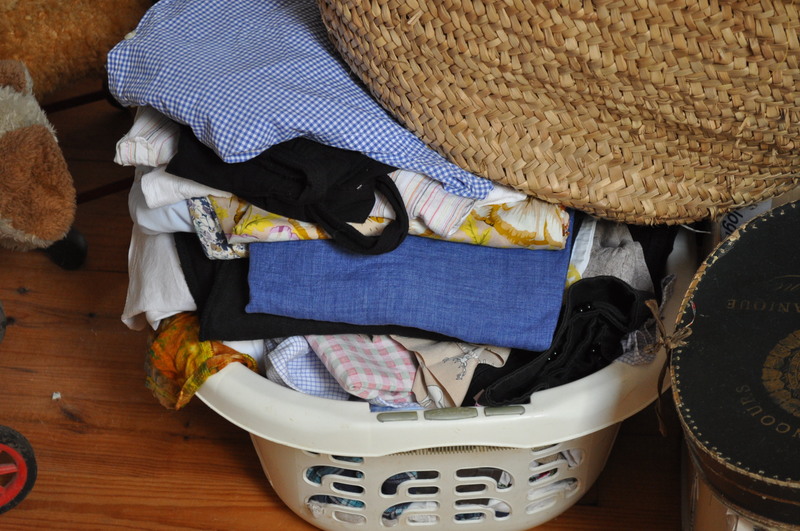 Here’s something I haven’t caught up on – the perennial ironing basket which I took from my laundry room up to my workroom as that seems to be the only place I brandish an iron these days. As you can see, my scheme didn’t work. 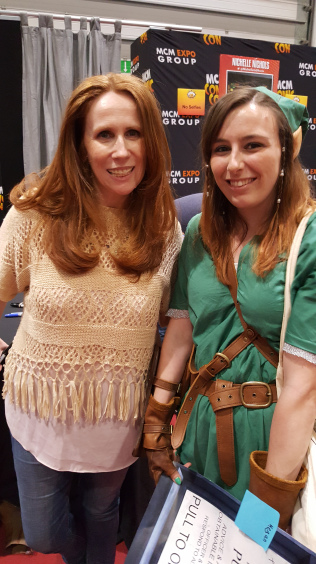 I did catch up with Mlle. Tialys the elder when I was in the U.K. as she came up to see me when I was at my Mum’s thereby killing two old birds with one stone. 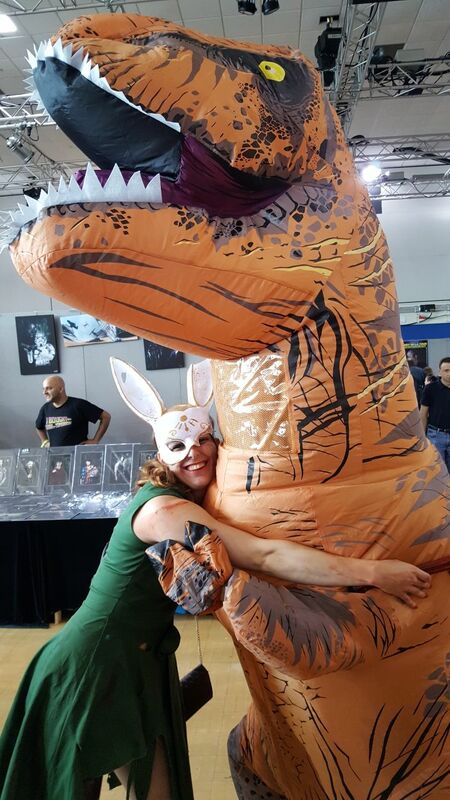 Oh to be young enough to dress up as a bloody (in the covered in blood sense) rabbit thingy and hug a dinosaur as she did last weekend. 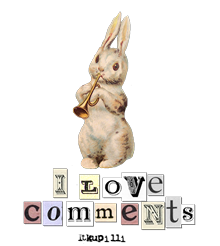 The details of the whys and wherefores shouldn’t bother you – I certainly don’t like to delve too deep. 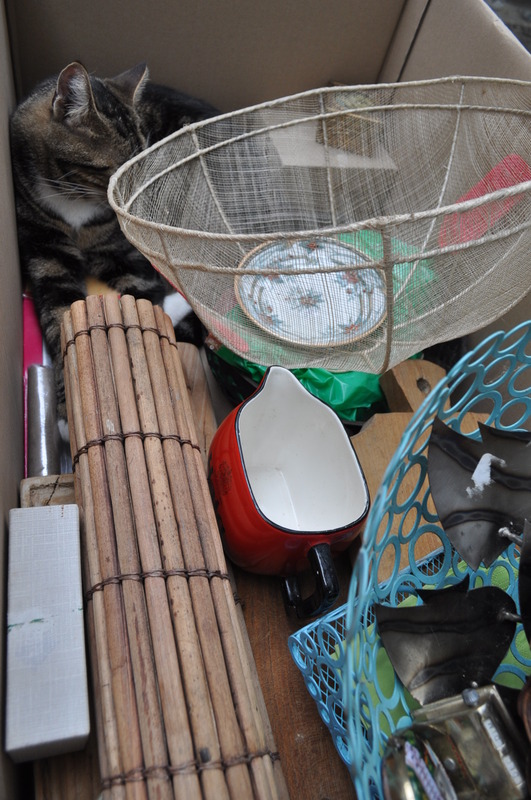 Off to look at the ironing basket again before doing something completely different. I have recently emerged from a 5 day internet blackout due to some twonk disconnecting our cable whilst connecting somebody else up. It didn’t help that it happened the day before a public holiday which fell on a Thursday and, it being France, they like to take the Friday off as well so that they get a nice long weekend – a phenomenon I won’t comment on as I have to live here. 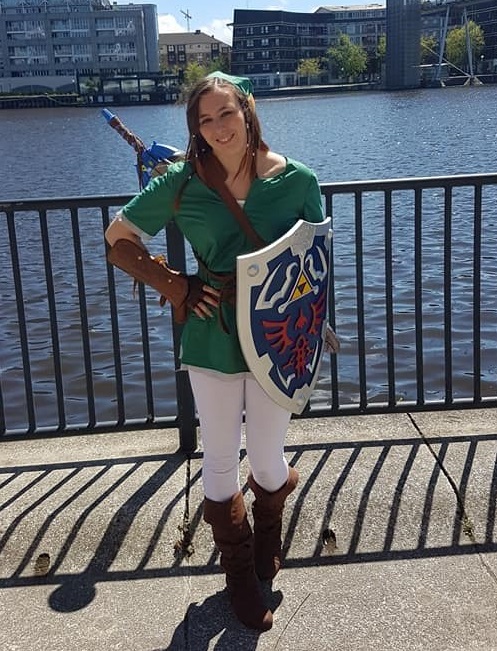 I would like to tell you that it was a refreshing change of pace for me and enabled me to catch up on projects and chores long forgotten but, in reality, it was a pain in the arse. I had no fixed phone line on which to make international calls so couldn’t contact my Mum, husband or eldest daughter, no telly, no Spotify and, what was worse, no Google. Mr. T had to cancel his flight home as he needed to have an internet connection on the Friday and I closed my Etsy shops in case anybody bought anything as I wouldn’t have known about it. What about your mobile I hear you ask. 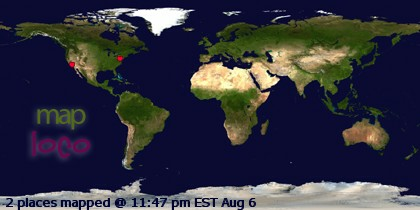 Well, I did eventually set up a hot spot to check my emails and so many came through – some with photos! – that I whizzed through my data allowance pretty quickly – well, I did stream a Netflix film through it too on Saturday night which might not have helped so now I am data-less until 22nd June. However, it did make me think that I could pay to have a whopping amount of data and do away with the dreaded ‘livebox’ and reliance on the wobbly pole that holds all the cables over the road. The only thing stopping me – I think, as I have to look into it a bit more – is the international calls which come free with our current tariff. Does anybody exist with just their mobile/cell/portable – how is it for you? 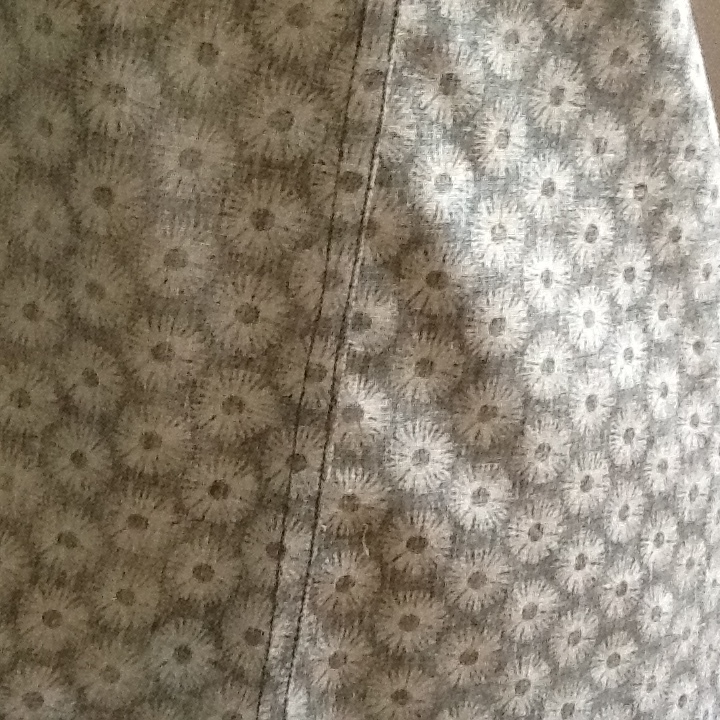 Now, having bored you rigid with my decidedly non-tech tech-talk, on to the ‘quilting capitulation’ of the title . 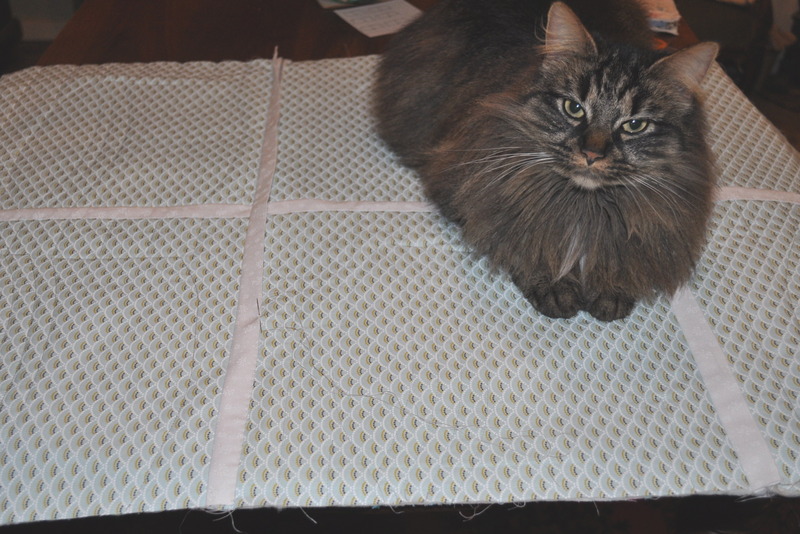 Remember this quilt top that I had put together and even got as far as spray basting it with the batting and backing? 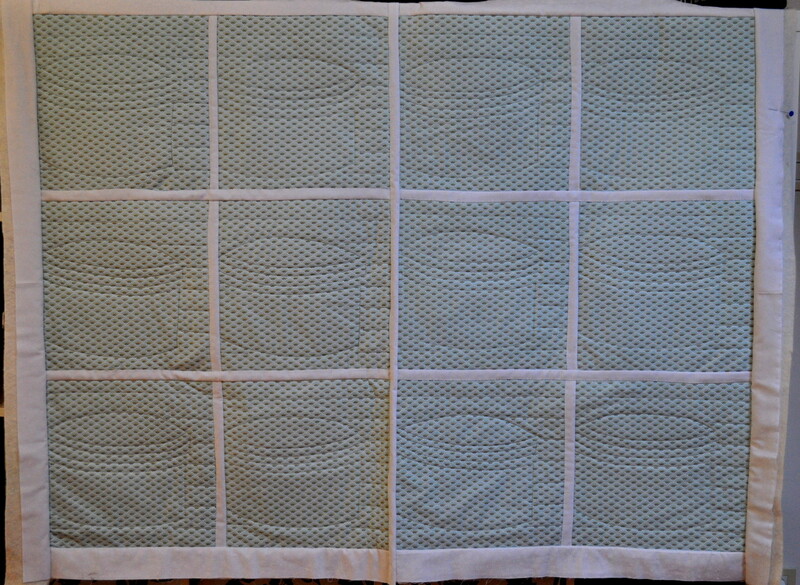 I decided to machine quilt it by following the lines of the ‘braids’ across the width of the quilt. I was soon disabused of this notion as the constant stopping and changing direction for the chevrons was making my layers shift – which is actually a very good euphemism for how I was feeling. 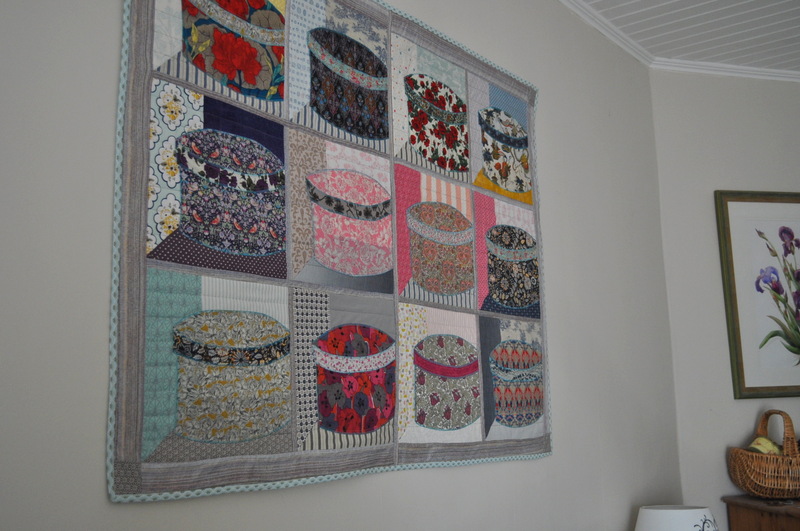 So, I said ‘enough’ -or another couple of words that I won’t put into print – and decided to act on my previous deliberations and send it off to be professionally quilted. I have never done this before but I thought I’d give it a try. It has been done and, as we speak, being sent back to Mr. T.’s office in the U.K. and he will probably be able to bring it back with him next Thursday so I am waiting with excitement – and a little trepidation – to see how it has turned out. 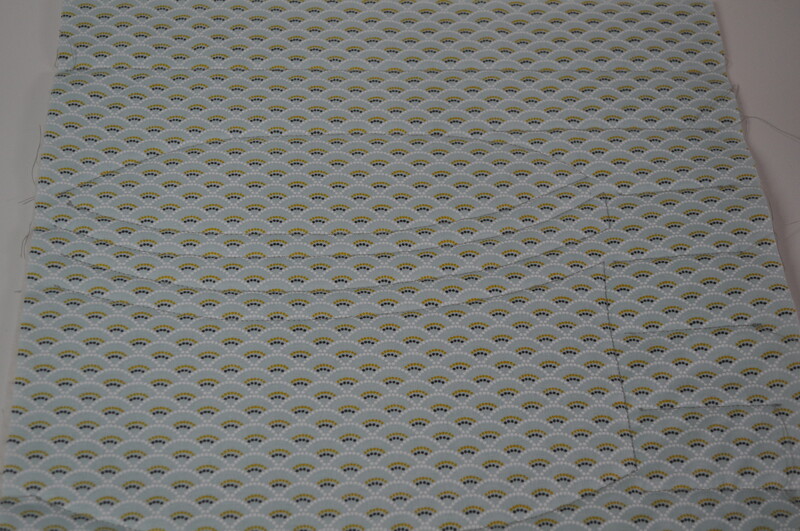 I found the price for quilting very reasonable although, once the batting and backing materials were added on it gave me a jolt but then I would have had to have bought those in any case – it’s just seeing the cost all in one place. 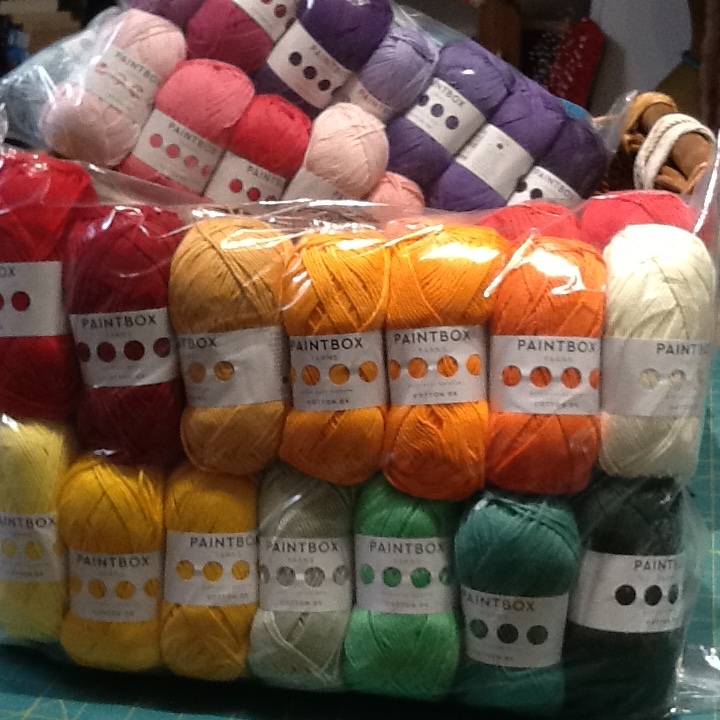 Anyway, as soon as it has arrived and I have put the binding on I will let you know how it went. 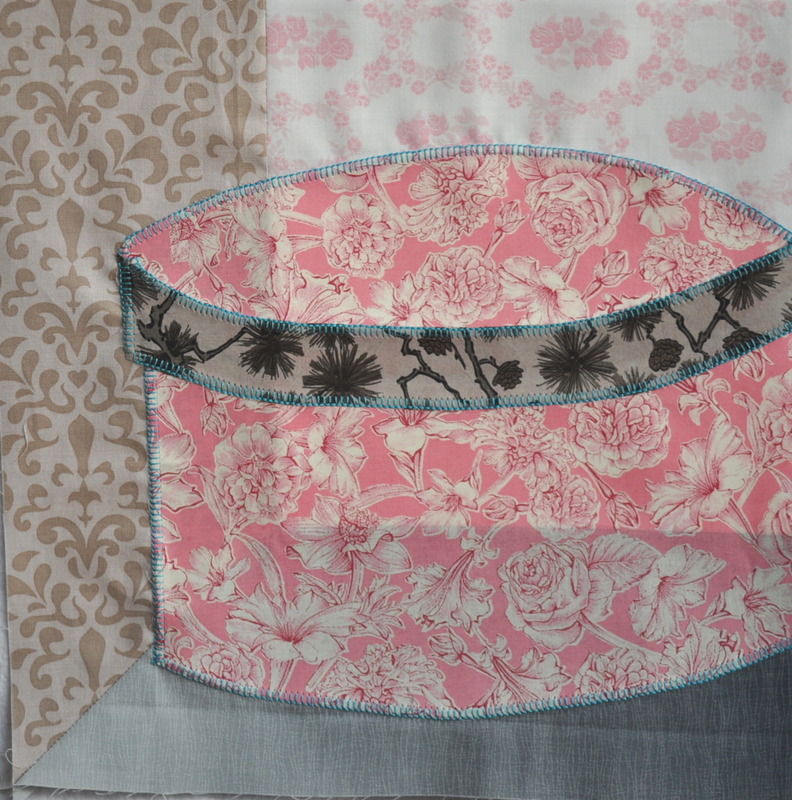 I could have had the binding put on professionally too but I thought doing it myself would allow me to ‘reconnect’ with the quilt again which sounds really pretentious but you get my drift. 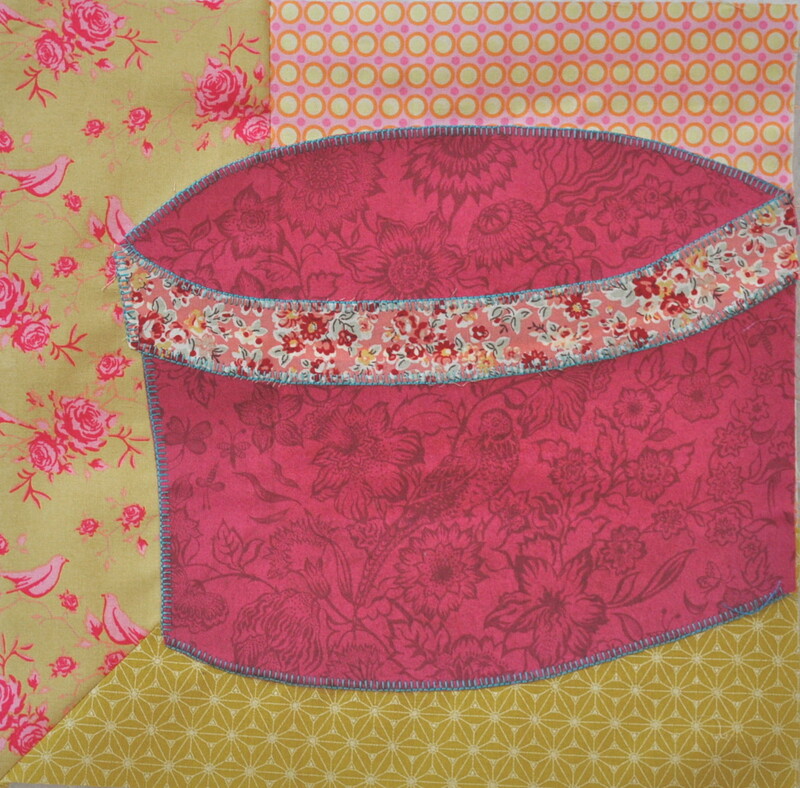 So, on to the ‘hatbox hiatus’. 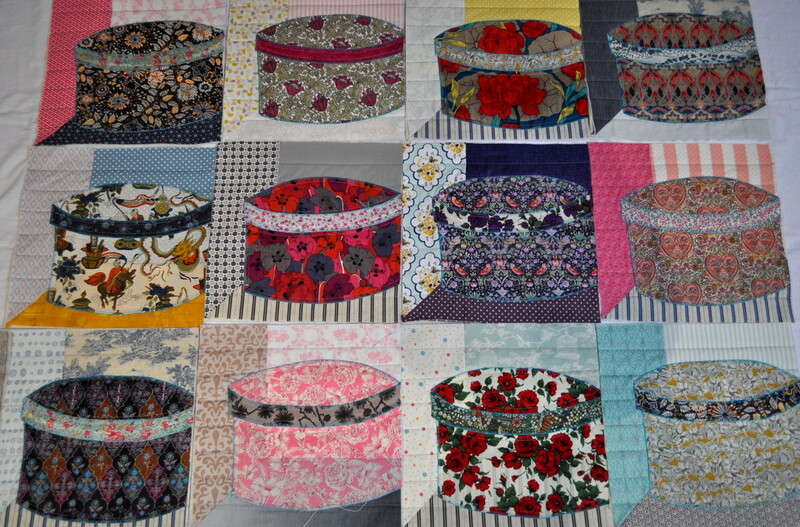 It is the end of the month and Kate over at Tall Tales from Chiconia and I are still busy with our hatboxes. 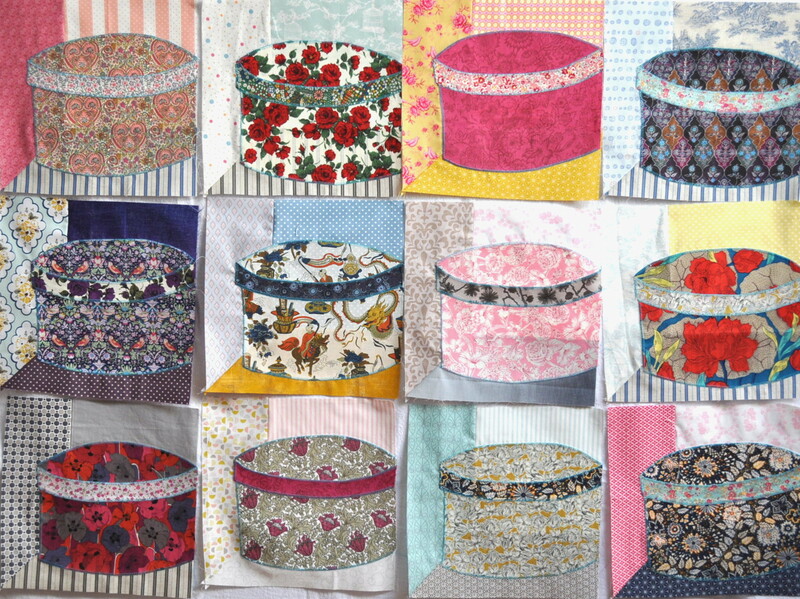 Mine are all finished now as I only needed twelve for a wall hanging but Kate is making a full size quilt so is still constructing her boxes. 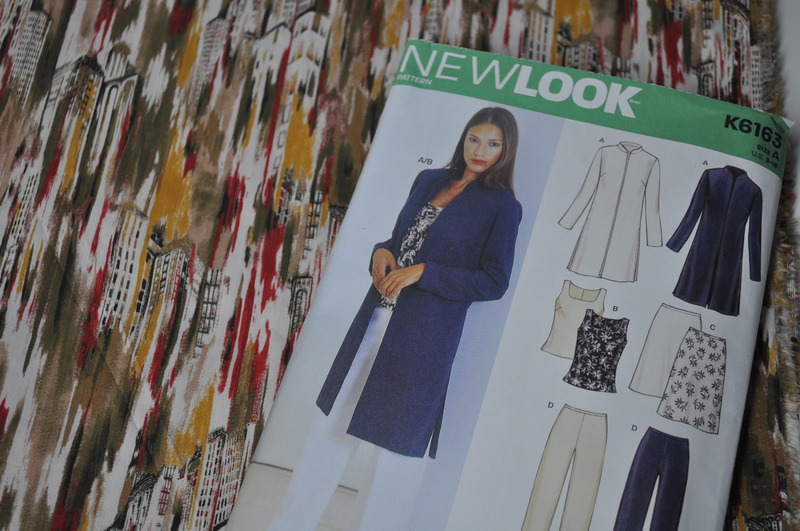 I now need to make decisions regarding sashing and backing. 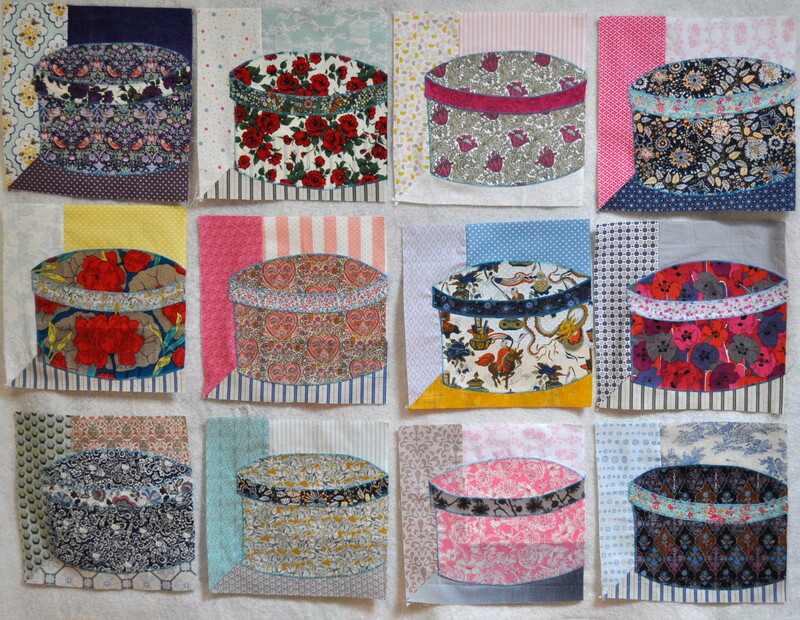 Here are my blocks, just to remind you, and they are definitely not in their final layout due to the pesky but lovely deep gold and pink one which I’m finding hard to place but I’ll get there in the end. 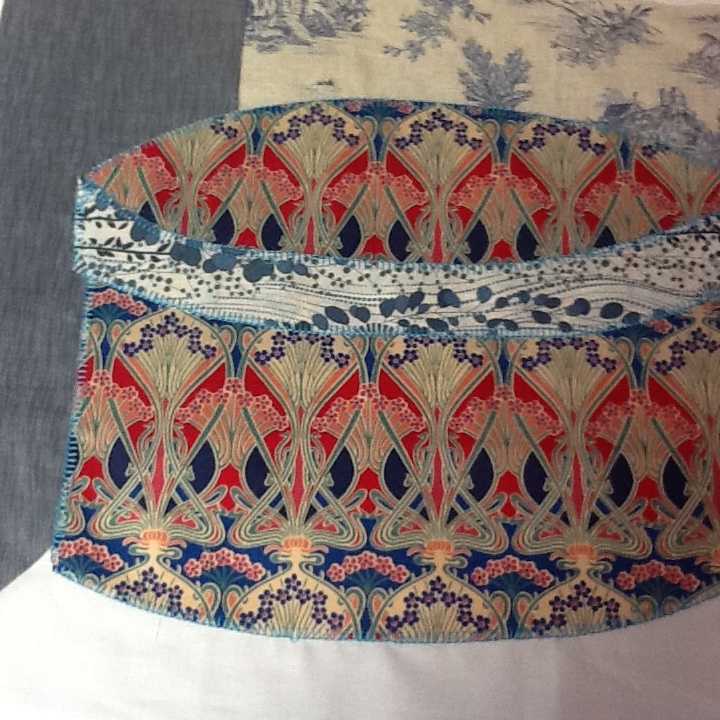 The backing doesn’t really matter as you won’t see it – although I’ll know it’s there so I don’t want anything too nasty – but I’m not sure whether to use a plain colour for the sashing (which will only be about an inch/2.5cm wide) or something patterned. These blocks are 12.5 inches square each so I don’t think I’ll put on a border as it might make too much of a statement on the bedroom wall and Mr. T. might complain. Anyway, there it is at the end of May and, by the end of June, I should not only have made some decisions but acted on them too. 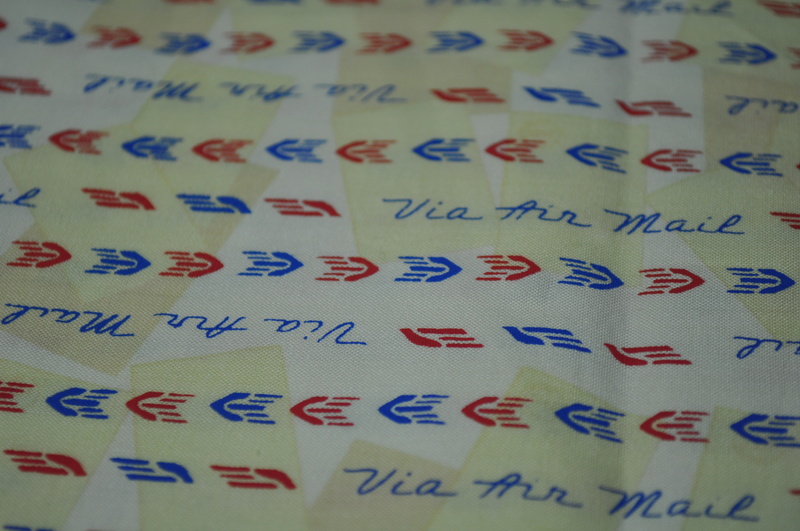 Speaking of Kate, I haven’t shown you better photos of my Walthamstow Market fabric haul yet but I will sneak this one in as it will be used to make a couple of blocks for the new quilt Kate will be assembling for auction in aid of Ovarian Cancer Australia. 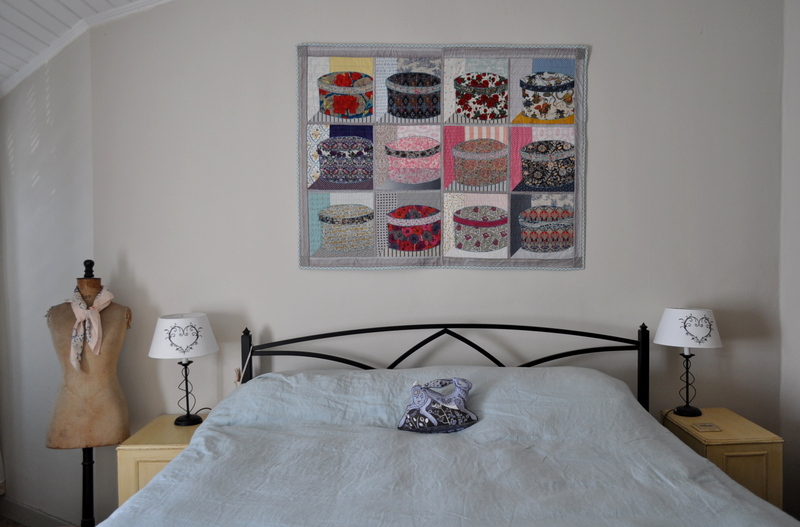 You may know that the ribbon colour for Ovarian Cancer is teal blue and the quilts Kate makes primarily by her own efforts but also with donated blocks feature a lot of teal fabrics and the names she gives each quilt reflects her love of puns. So far we’ve had ‘Time for Teal’ (which featured lots of teapots, cups and saucers) and ‘Tealed with a Kiss’ (lots of crosses). 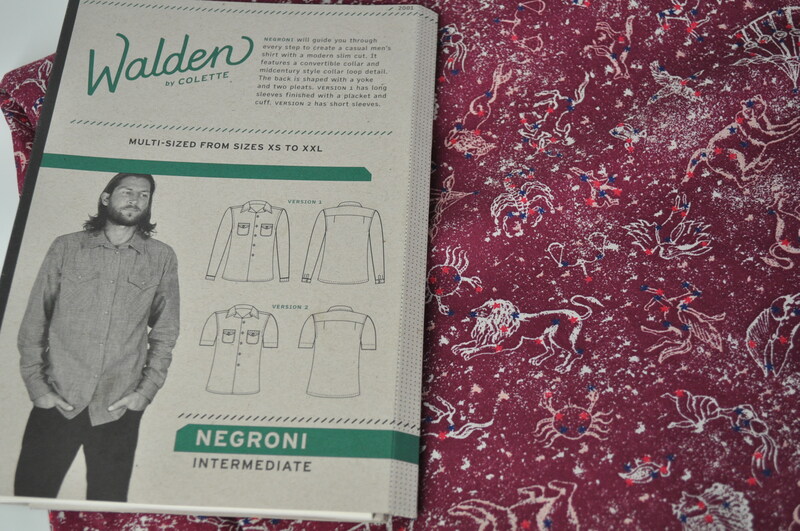 Anyway, the next one is called ‘Signed, Tealed, Delivered’ and will have a postcard, letter type theme. So, look what I found. I’m looking forward to paper piecing a few envelopes as I haven’t had much call to do FPP lately and I don’t want to get out of the habit as I was progressing nicely. 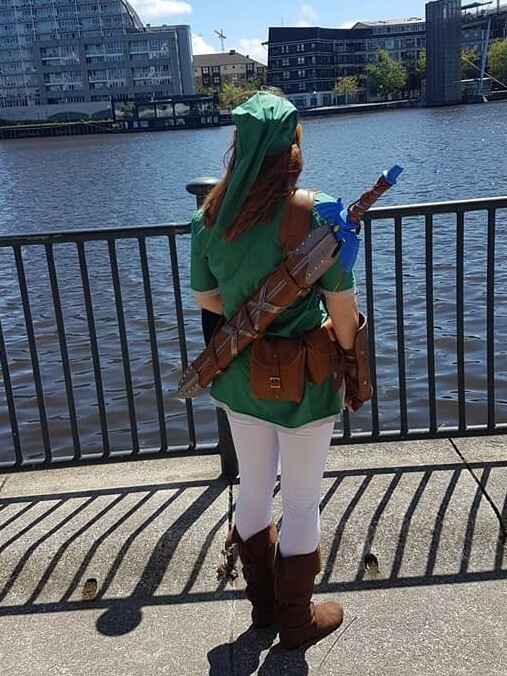 her Dad make all the leather bits – straps, belt pouches, sword scabbard, arm protector thingy but not the boots which were from eBay. and for any of my readers who are Doctor Who fans. 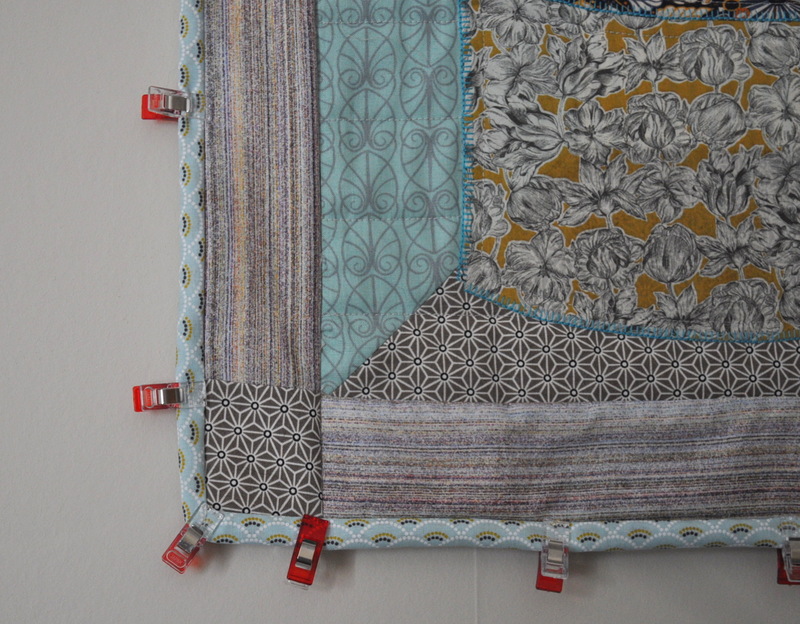 Remember when I said that Kate over at Tall Tales from Chiconia was making a quilt from a Kaffe Fassett book that I had lusted after for some years? (If not, you can read my original post here ). Kate’s way ahead of me with her blocks but, then again, she started first and she’s making a quilt whereas I’m late to the party and am only making a wall hanging. Here’s the version in the book that inspired us. 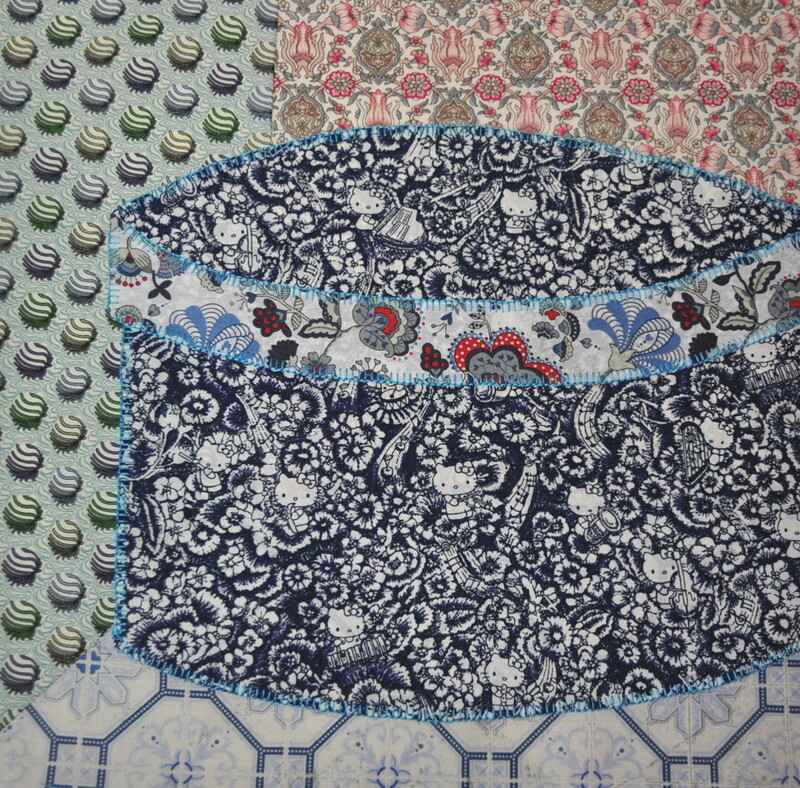 All my hatboxes are going to be made in Liberty of London tana lawn with various scraps of other fabric for the ‘wallpaper’ and ‘floor’ in the ‘cubby holes’ which each contain one hatbox. We pledged to complete three hatboxes every month. These are my three for February. 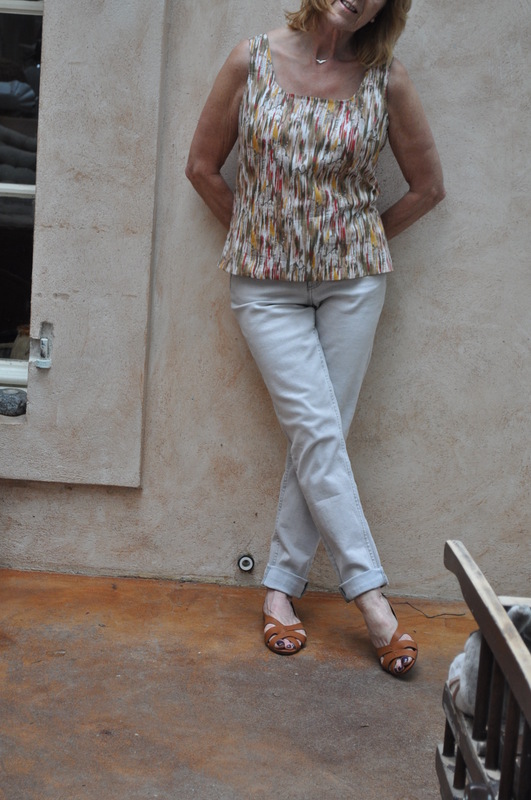 I used this gold/yellow tana lawn that I used to make a blouse some time ago although I seem to have quite a lot of it left. I like the backgrounds here – the duck egg blue is the predominant colour in my bedroom where the finished wallhanging will be displayed. This was actually the first one I made but it went wrong and I was going to ditch it but, in one of my rare patient and resourceful moments, managed to peel off the appliqué, re-cut it, re-position it and salvage the block. I need twelve blocks in total. Some might not make the final cut. 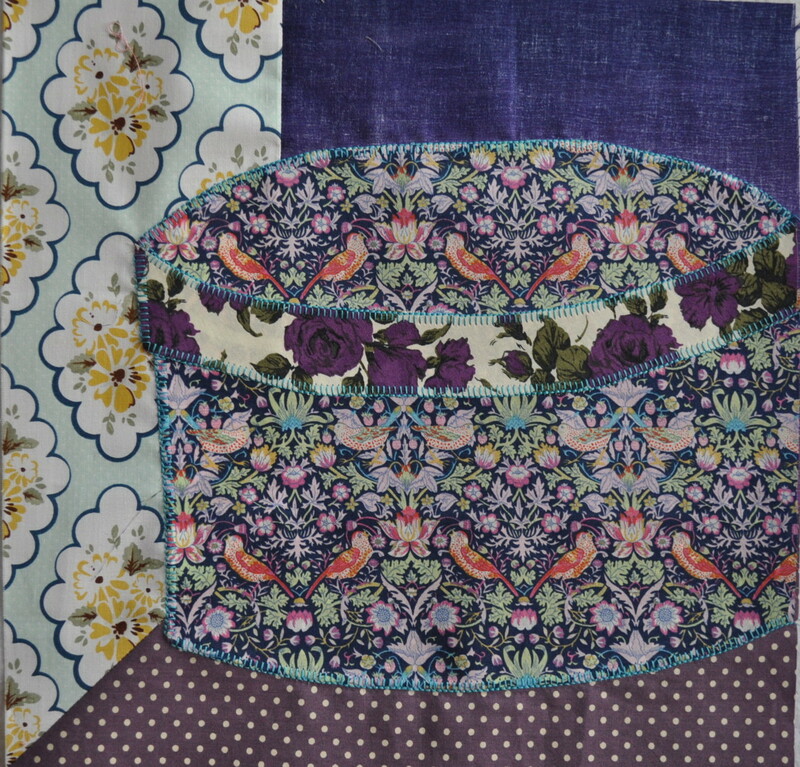 Although I like the background fabrics in this block – especially the Tilda one with birds – the colours might be too overpowering to work with the others in the wallhanging plus I set the right hand side of the base of the hatbox a little higher than the others and it’s a bit on the wonk so we’ll see. Here are all six I’ve completed so far which I’ve displayed on my design wall. I call it a design wall but, in reality, it’s a flannel sheet draped over a towel rail which the blocks are clinging to in the manner of a set of Fuzzy Felt – how I used to adore my fuzzy felts – and this is the extent of its displaying capabilities. 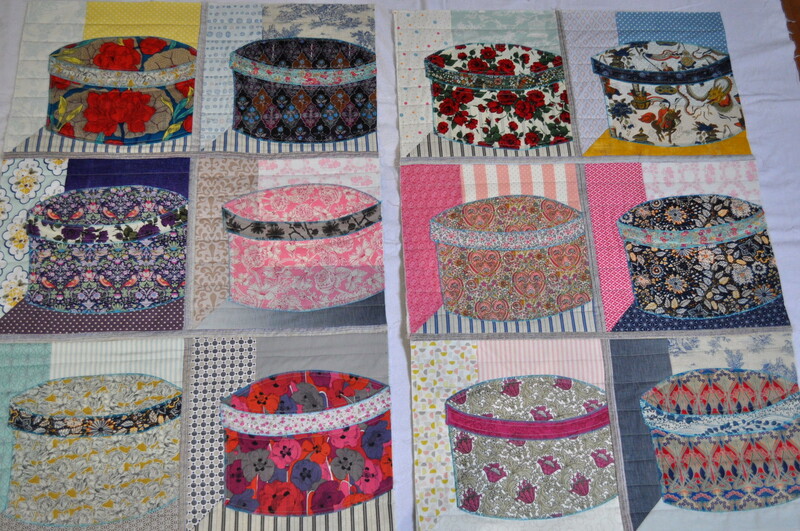 Eventually, the layout will be four hatboxes across and three down with sashing and, possibly, a border. Should be ready around May/June time. Talk of Fuzzy Felt sent me off down a rabbit hole and I found myself looking at vintage sets. 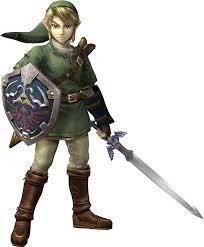 and I had one with mostly shapes so you could be a bit freestyle. ………………although that might just be wishful thinking because I loved Noddy and – look! – they’ve got proper little faces and everything. I know these were made in England but my non-Brit followers might have had them because, according to Wikipedia, since the creation of Fuzzy Felt in the 1950s, more than 25 million sets have been sold internationally and although Fuzzy-Felt reached its peak in popularity sometime in the mid-1970s, it remains an iconic children’s toy, still enjoyed by children who play with it and parents who nostalgically purchase it. Don’t think I’m not tempted. So – which sets did you have? If it was something like a My Little Pony set or anything else post 1980, don’t tell me as you are too young and I will become depressed. 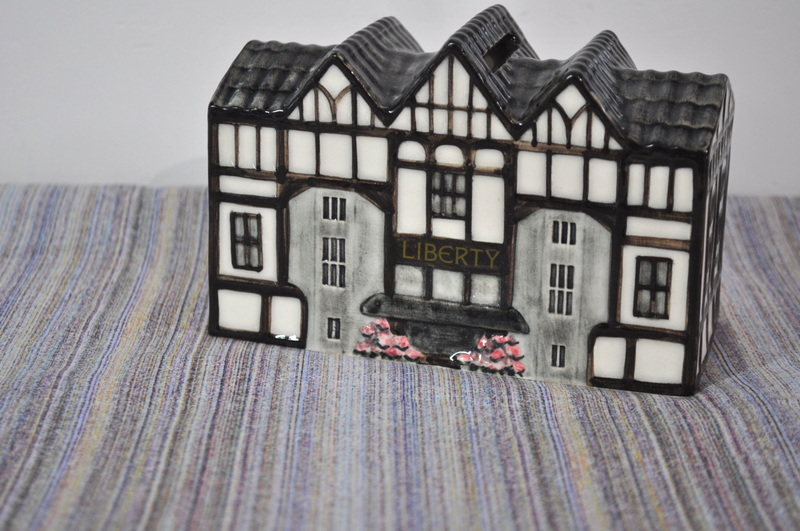 You are currently browsing the archives for the Liberty Hatbox Project category.